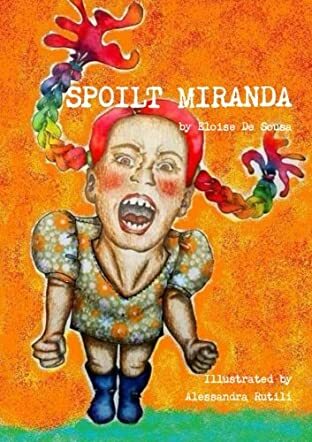 Spoilt Miranda by Eloise De Sousa revolves around Miranda and her tantrums that are driving her family mad. Miranda is a spoilt and sulky child, unlike her brothers and sisters. Her parents found it embarrassing to take her anywhere with them because she would sulk and pout - she thought no one could touch her, including the policewoman who comes to check on her. The family goes to Aunt Joan's beach house on the Dorset coast for their summer family holiday. Miranda continues with her usual behavior, but for once Miranda finds herself on the other end of tantrums. She finds it surprising at first, and scowls and pouts to no avail. Will she realize her mistakes and change for the better? Or will she still be the same incorrigible Miranda? It is a good story that tells kids about the disadvantages of being a problematic child and how one person's tantrums can spoil everything for the other siblings in the family. The changes that come about in Miranda during their summer vacation are indeed inspirational for kids to rectify their behavior. The illustrations are good and they give a personality to Miranda and the rest of the characters in the story. Miranda's character is relatable since many parents have kids like Miranda. It is a peppy story that kids will enjoy reading. Miranda and her dreams tell us how kids make a scary place for themselves. The terrible tantrums, summer holidays and the kids make this book a wonderful read.